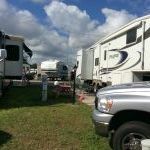 Ask fellow campers about "Whispering Palms RV Resort (55+ park)" and nearby attractions. Checked in on a Friday, paid for three nights, was told no one would be in office on Sunday. Left on Sunday left a note and asked for a refund on my card. Got a call Monday saying that they don't do refunds. Park was nearly empty, mostly seasonal at this time of year mid April. Site water handle was missing. Traveled from Vermont to Florida and would have to say I would never go back to this place. We camped at Whispering Palms RV Resort (55+ park) in a Travel Trailer. If you like in your face road noise augmented by train noise with narrow hard to access sites, this is the place for you. Basics: roads are paved and easy to drive until you have to make a turn. The sites are narrow and pretty much right on top of one another. The turn into our site was a major trick to shoehorn between the water hook up on the right side and the sewer on the left. Verizon phone and mifi worked well, apparently they have wifi but we saw no signal from our site so maybe it works up at the office. The pool is salt water and clean, showers were hot with ok pressure and the bathrooms were clean. Our stay here was a last minute thing and this was the only place in the area that had any space. We had to move to another site for our 2nd night. I'm pretty sure we're not going to stay here again just for the difficulty of site access. The staff was great and everything was clean. 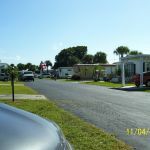 We camped at Whispering Palms RV Resort (55+ park) in a Motorhome. Conveniently located on US 1. Easy access to paved sites. Mixed use park with some full-time residents and a ton of mature snow birds including a large contingency from Canada. They have shuffleboard, putting green, and activity center with quite a bit going on. Restrooms were quite clean and electronically secured. Had a bit of a problem with my reservation but staff was able to take care of it. The office and grounds staff were all quite friendly as were the folks staying here. NOTE: US1 is a busy four-lane road. The sites along the road have road noise and there is no barrier. There are also train tracks close enough to hear the trains. We are in a well insulated, well built rig but the noise still got to me. As work traffic picked up in the morning, it work me up. The pull thrus by the road are tight and subject to road noise. Scout your turns as some are rather tight for 45 foot fifth wheel. We camped at Whispering Palms RV Resort (55+ park) in a Fifth Wheel. Check out the barrier islands via A1A. There is a state park and county park with RV hookups that we will try next year. Dine at Outriggers. They have daily specials and we were there for Tuesday clams. Get there early, they sell out. Also dine at Slack Tide. We enjoyed great oysters and shrimp. Free Friday Concerts just a bit south of Melborne on the first Friday of each month. Produce market just north of the RV park is awesome. This facility is average. The interior roads are not bad but the pull through sites for short term stays are very tight to get in because the sewer drain and the water hookups are on both sides of the entrance to the site. In fact the water hookups are on the wrong side of today's modern RVs. We struggled to get our 40 foot motorhome into the site and have watched others having similar issues. Clearances are inches when maneuvering into the sites. You will need to pull your tow vehicles sideways in the pad in order to fit any rig larger than 40 feet. Lots of permanents located throughout the park. The exception is the front 3 rows near the road. Road noise and trains can be heard most of the day and night. Bring a long 50ft water hose to reach the opposite side of RV for hookups. We camped at Whispering Palms RV Resort (55+ park) in a Motorhome. As other reviewers have said this is a very large snowbirds park. Due to our late booking (last October) the only space left was a back-in at the back of the park near the railroad. There was a $50 discount for being near the railroad. Our site was small but adequate for our 36ft trailer plus tow truck. There are many activities should you choose to join in plus 2 good sized swimming pools. Staff were very pleasant as were our neighbours and folks we met. Shops and beaches all in reasonable distance and very good. Downside is wifi is only available at the office/mailroom but connection is very good there. We took the Comcast package which is a personal modem for $40 PM which worked exceptionally well. We have only rated it 6 due to our site but we do recommend this RV park and advise very early booking as many of the residents return each year. for overnighters there are pull thru sites at the front of the park. We camped at Whispering Palms RV Resort (55+ park) in a Fifth Wheel. Long sandy beaches. Malls at Verro Beach and Outlet Mall. Clean park. It's a bit of a large mega park. If you are staying nightly or weekly, you will most likely be put into sites that are like a parking lot. We felt surrounded by RV's and sitting outside was like being squished by them. Lots a seasonals here with really nice places and nice RV sites in the middle, interspersed with mobile homes. We were in lot 12, a pull-thru, for a week. Glad it was no longer. But on a positive side, excellent location to see sights and a beautiful drive to Vero Beach along the island road. Only five miles to beautiful beaches too. Great waterfront restaurants in town. Lady at checkout seemed to do just what she had to do. We had to ask about good Sam discount, and if there were any activities, and then if we could get a calendar of them. Lots of activities. Not too many RV resorts around Sebastian so this is probably the one to stay at. Ask to be in middle of sites. On the West side trains go by and they are close to the tracks! We camped at Whispering Palms RV Resort (55+ park) in a Fifth Wheel. Be sure to eat a Grouper Reuben at Crab-E Bills! We had locals recommend this and they were right on! Also had fun at the Tiki Bar in the beach road. Vero beach is a quaint, beachy-type town. (expensive shops). About 10 miles south. Take island road. We went two times to the restaurant Woody's Driftwood Inn. Great to sit outside and see the beach and sip a cold one! We stayed for a month and would certainly stay again. The park is huge and is mostly mobile homes and park models but they are well-maintained and the people are very friendly. The streets are all paved and level. Our site was around the little lake and there was a nice breeze every day. The only drawback is the location of the park. It is right next to a main road so there is a lot of traffic noise if you are at the front and there is a train if you are situated at the back. However, the location itself is very good with the beach and restaurants close by. We camped at Whispering Palms RV Resort (55+ park) in a Motorhome. Large well-kept, clean park with mix of mobile homes, park models, trailers, and motor homes. 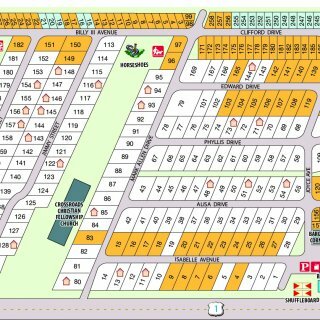 Short term sites appear to be on the row directly next to US-1. Pool adjacent to highway. Sites at the rear are close (rear row within 75 feet) to FL East Coast rail line with long rumbling freight trains at night. Several bathhouses and laundry facilities, clubhouse near the park entrance. Confirmation emails from office do not include reservation dates which office had in error. C confirm reservation before arrival or request written confirmation of dates to avoid extra charges! Acceptable over the air broadcast television. We camped at Whispering Palms RV Resort (55+ park) in a Motorhome. This is a very nice park for stays of 2 weeks or more. Plenty of well-kept amenities and an active social club that welcomes visiting participants. Many of the seasonal residents are French Canadian, but just as many aren't. Participants in the games and activities are both Canadian and not. If one doesn't speak French a smile and a "bonjour", even badly pronounced, goes a long way. It is a 55+ park, but children occasionally visit. There are no dedicated facilities for children. There are several dog walk areas, but no dedicated dog run. The park is less than 10 miles from almost every activity or interest offered in this part of Florida, and is the most reasonably priced park in the area. It is older, but well maintained, attractive, and clean. The price I pay reflects a monthly rate. We camped at Whispering Palms RV Resort (55+ park) in a Motorhome. This appears to be a pretty much seasonal park allowing transient RV's a place to stay. Sites are level and easy to get in and out of. We didn't use the showers or facilities, however, the dumpsters were full to the point of overflowing. Adequate for an overnight stay, going up I-95. We camped at Whispering Palms RV Resort (55+ park) in a Motorhome. On the positive side, the staff is very helpful and friendly. The park is older but well maintained. It's bathrooms are remodeled and both pools are well maintained. On the negative side, wifi is only available on one side of the park and you had better be close to the tower for it to work well. The other complaint is that the park is divided into 2 camps, those who speak English and those who speak French. The wifi connection is in the French speaking area and they really don't want to associate with non-French speaking folks. I hesitate to write about this because we have never experienced this in our many visits to Canada. Canadians have ever been kind courteous, and lovely to be around. Whispering Palms seems to have attracted a very large group of unpleasant French Canadians who won't speak to anyone but each other. We had Thanksgiving at the park and the room had an invisible line drawn down the middle of the room. One side for the French Canadians and the other for the rest of us. Many of the residents are so tired of what's going on that they are selling their park models to go elsewhere. It's a shame because it a nice park. We stayed here for a month and after the first 2 weeks asked to be moved to another site because we felt so unwelcome where we were. It's OK for a nights stay but I would not recommend it as a long term place to stay given the atmosphere. We camped at Whispering Palms RV Resort (55+ park) in a Motorhome. Nice park. Our site was next to road but noise wasn't too bad most of the time. Pull through sites are paved w/table but are tight and might be easier to back into! A few have a small amount of shade. Limited cable TV. Bring your own drinking water which we've found to be the case in a lot of parks. You can choose a back in site elsewhere in the park if available, but you may not have cable TV. Nice pool at office entrance. Bath house at office entrance was closed for remodeling as was the laundry but another one was open further back in the park (laundry smaller) neither had AC. Staff was friendly and helpful. Rate reflects Camping Club weekly rate which is very liberal, can stay 2 weeks at this rate! Best we've found. Will stay again when in area since it is just 10 minutes to the beach. Good place to eat in the "Village" in Sebastian is Las Palmas Cuban Restaurant right on US1. We camped at Whispering Palms RV Resort (55+ park) in a Fifth Wheel. We stayed on a Passport America rate. We had a pull through site. Staff was very friendly. Has a nice pool and it's a very clean campground. The WiFi in the clubhouse worked fine, but not at the site. We would stay here again. We camped at Whispering Palms RV Resort (55+ park) in a Fifth Wheel. This campground is the only full hookup facility in the area. The others are better locations, but do not have the full hook-up. The sites are tight; we could not open our awning all the way because it would hit our neighbors slide out. This campground is right on US 1, and the road noise from traffic goes all night. We have a 40 foot class A with a 24 foot trailer for our toys, and we had plenty of room to pull around and drive into the site as long as the end site is not occupied. If they are then you might have a problem... The sites are fairly level. If you have kids as we do, the local residents are not so friendly to them. There are no frills here but the hook-up are very good. They keep the place clean and the two separate times I was there, the management had lost my reservations. So I recommend that you double and triple check your reservation here. We camped at Whispering Palms RV Resort (55+ park) in a Motorhome. Be sure to eat a Grouper Reuben at Crab-E Bills! We had locals recommend this and they were right on! Also had fun at the Tiki Bar in the beach road. Vero beach is a quaint, beachy-type town. (expensive shops). About 10 miles south. Take island road. We went two times to the restaurant Woody's Driftwood Inn. Great to sit outside and see the beach and sip a cold one! Are you affiliated with Whispering Palms RV Resort (55+ park) ?